Most UK stores now offer 'click & collect' services, including Boots, Tesco and Argos. Here, we explain how each works, including any costs, minimum spend required and how long you have to pick up your items. If you’re not keen on spending your Saturdays in a packed supermarket surrounded by screaming kids, click and collect could be the answer. Many UK retailers now offer click and collect services, which offers the convenience of shopping online at little to no extra cost. It’s the perfect middle ground for many, which explains why the click & collect sector is forecast to grow by 50% in the UK over the next five years. But with stores operating different policies, including minimum spend, length of slots and cost of collection, it’s worth checking what the deal is at your local supermarket. Check out our weekly supermarket deals here. 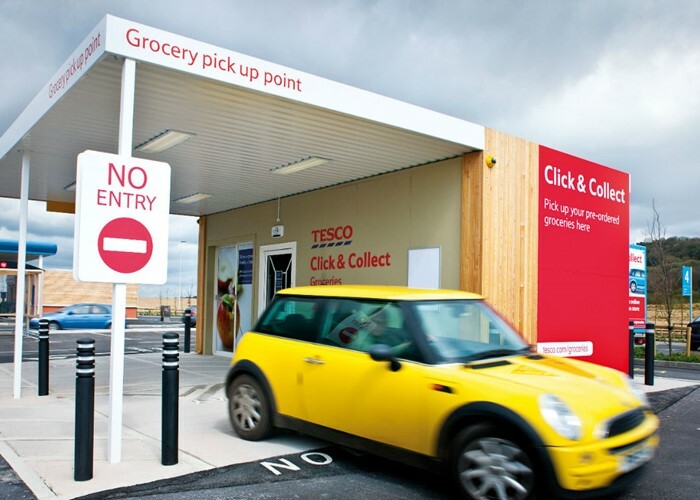 Tesco offers click and collect at 320 different stores across the UK. You can find out whether your local branch offers the service by using their location tool. Until 10th February, Tesco have a lower minimum spend of £25 – if your shopping costs less than this, you’ll be subject to a £4 minimum basket charge. After 10th February, the minimum spend will go back up to the usual £40. It depends on the slot you choose. You can select ‘next day collection’ which can be free or cost up to £2 depending on your slot. Or, many stores now offer same-day collection. Either order by 9am for collection after 12pm or order by 1pm for collection after 4pm. These slots are £2-£4. What do I need to collect my shopping? You’ll need either the order number or the card that was used to pay for the shopping. Someone else can collect your shopping for you if they bring one of these things. How long will I have to collect my items? Tesco offer 2-hour slots in which to collect your shopping. Either, pay 40p to have your shopping packed into bags. Or, select the ‘bagless’ option – which means you’ll need to come with bags when you pick up your shopping. Find out the 8 times supermarket own-brands are on par with branded products. Click and collect is currently available at 124 stores across the UK. Use the store locator to find out if your local store has the service. Yes. You’ll need to spend £40 if you want to avoid a £4 minimum spend charge being added to your shopping. Click and collect services are free, unless you opt for same day collection, in which case it’ll cost £2. What do I need in order to collect my shopping? Sainsbury’s requires you to bring ONE of the following items: your booking confirmation, the debit or credit card used to place the order, a photo ID, or any other card with the PASS logo. Someone else can collect your shopping for you if they bring one of these things. Before you check out, you can choose either bagless (free) or pay 40p for bags. You can place your order up to 20 days in advance. You can amend your order up until 11pm on the day before collection. There are hundreds of click and collect locations across the UK – to find your nearest, use the store locator. Yes – you must spend £26 in order to use the service. There’s no fee if you spend less, you simply won’t be able to use the service. The service is free regardless of the slot you choose. When you use Asda’s click and collect service, you’ll have the option to either pick up in-store or from a locker or automated collection point. If you’re picking up in store, it works like most other supermarkets – you simply bring along either your order confirmation, payment card or ID. If you opt for locker collection or automated collection, your shopping will be stored in temperature-controlled lockers to pick up. All you need to do is scan or tap in your unique code (which you’ll receive in your order confirmation) to pick up your shopping. Someone else can pick up your shopping provided they bring the documents mentioned above. How long do I have to collect my shopping? Asda offers one-hour collection slots. Like many other supermarkets, Asda’s default is ‘no carrier bags’ – you must click on ‘Other Information’ at the checkout, click ‘Change’ and select ‘Use carrier bags’ (for a 40p charge) if you’d like them. You can also pick up homewares and clothing from George at an Asda collection point. Want to save money on your shopping? Check out the £5 Family Meal Deal. All Argos stores allow you to either reserve or buy online and collect in store – find your local branch by using the store locator. There are two ways to click & collect with Argos – all stores offer the reservation service, and most also offer ‘Fast Track’. This is where you buy online and collect in store, at one of their Fast Track counters, which means beating the queue. Alternatively, you can reserve online and pay in store, in which case you’ll still have to queue as usual. The service is free – although you can’t pick up very large or potentially hazardous items such as knives. These items will be marked as ‘Home delivery only’ online. You’ll need your order details or reference number when you collect the item. Someone else can collect your shopping for you if they bring one of these things. If you’ve reserved but not paid, head to the till or pay at a kiosk before you pick up the item. If you opt for Fast Track, you’ll have a seven-day window in which to pick up your items. If you reserve for collection, stores will hold your items for one day, although you can extend this by two further days online. You may also be able to pick up your item in one of over 100 Sainsbury’s stores. Collection is available in 2,200 Boots stores. Find your local store here. There’s no minimum spend, although certain products aren’t available for collection – they’ll be highlighted in your basket online. The service is free. If you order by 8pm you can usually pick up the item the next day after 12pm at no extra cost. What do I need in order to collect my items? You’ll need a copy of your order confirmation page, either printed or on your phone. Or, bring along your order number and photo ID. Someone else can collect your shopping for you if they bring these required documents. How long do I have to collect the item? Your order will be held in-store for 14 days before it is returned for a refund. If you order medicines marked with the green pharmacy cross symbol, you’ll be asked a few online questions to provide extra information. Morrisons currently offers no click & collect service, although you can pick up Amazon purchases in selected stores.